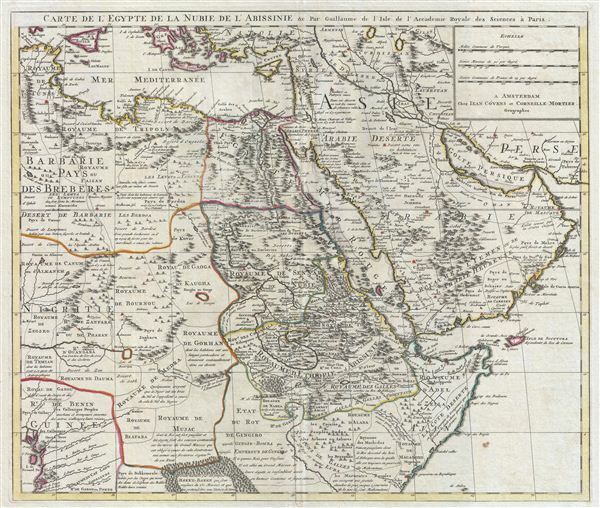 Carte de l'Egypte de la Nubie de L'Abissinie &c.
A fine example of the 1730 Covens and Mortier issue of Guillaume de L'Isle's important 1707 map of Arabia, egypt, Nubia, and Abyssinia. Centered on the Red Sea and the Nile Valley, this extraordinary Map covers from the Bight of Benin and the Kingdom of Tunis (Tunisia) eastward as far as the Persian Gulf, inclusive of modern day Saudi Arabia, egypt, ethiopia, Sudan, Libya, Tunisia, the United Arab emirates, Oman, Qatar, Iraq, Somalia, Yemen, Cyprus, et al. The map is rendered in De L'Isle's distinctive and innovative style which eschewed the flamboyant Dutch map work of the previous century in favor the highly detailed, information rich, and decorative cartographic approach seen here. De L'Isle is best known as a 'scientific cartographer' whose work often set the standard for most subsequent maps of whatever region he focuses on. This map is no exception and would remain the definitive picture of Arabia and the Nile Valley well into the early 19th century. even so, much of this area is only speculatively mapped and is largely unknown to european mapmakers. In Arabia De L'Isle based any of his cartographic advances on reports from diplomats, missionaries, and explorers, as well as on earlier Ottoman and Arabic maps in the French archives. In Africa, De L'Isle accessed similar reports as well as and hearsay that filtered up the Nile Valley from Christian enclaves in Abysinnia and Arab traders. For example, the Kingdom of Gingiro, here located to the south and west of Abyssinia, is known from the reports of the Jesuit Anton-Fernandez who traveled to the region in 1613 on a mission for King Philip II of Spain. Anton-Fernandez offer a wealth of detail about the Kingdom nothing that Gingiro means 'monkey' in the local language and that the king himself a kind of monkey-God. One hundred years later, when De L'Isle drew this map, Anton-Fernandez's journal remained one of the few reports of this region available and, for want more up to date information, was incorporated. Most other regions of Africa beyond the well mapped Lower Nile Valley and Abyssinia, rely on equal vagarious references. Published in the c. 1730 Covens and Mortier reissue of De L'isle's Atlas Nouveau. De L'Isle, G., Atlas Nouveau, Contenant Toutes Les Parties Du Monde, Ou sont exactement Remarquées les Empires, Monarchies, Royaumes, Etats, Republiques &c. Par Guillaume de l'Isle. Premier Géographe de sa Majeste, (Amsterdam, Covens and Mortier) c. 1730. Tibbetts, G. R., Arabia in Early Maps: A Bibliography of Maps Covering the Peninsula of Arabia, Printed in Western Europe from the Invention of Printing to the Year 1751, #199 and #241. Moreland, C., and Bannister, D., Antique Maps, a Collector's Handbook, page 267. Norwich, O. I., Norwich's Maps of Africa: An Illustrated and Annotated Cartobibliography, #298.